Boxers are lively, energetic dogs. Without discipline and direction they can become unruly and obnoxious. We conduct a weekly obedience class for our Boxers where a small battalion of volunteers works to teach dogs basic obedience, manners, and self-control. Our trainers are experienced, patient, and sometimes very brave. Our goal is not to produce “perfect” dogs but to teach them to behave in an acceptable manner, thereby making them more suitable for placement. The class is loosely structured with dogs at various levels of training attending. Some dogs participate mainly for socialization and to gain self-confidence. Classes also offer us a unique environment in which to observe and assess behavior, personality, social skills and the ability to coexist with other dogs. 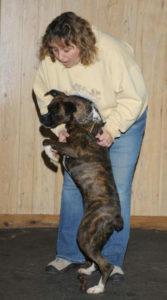 New owners are encouraged to continue training their adopted Boxer with us free of charge. Becoming a volunteer trainer involves a significant level of commitment: regular attendance, the ability to be firm but fair and a willingness to learn and use our training techniques are required. 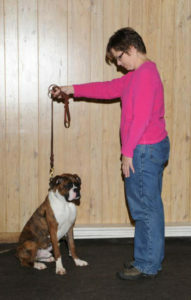 Less experienced trainers are expected to complete a Beginning Obedience Course at our facility.